Steam purple yam for 10 minutes until very soft. Remove and puree with an immersion blender while still warm. Do the same for sweet potatoes. Combine pureed purple yam, ¼ cup (60ml) vegetable oil, and ¼ cup (55g) granulated sugar in a nonstick fry pan. Cook over low heat until sugar has melted and vegetable oil is fully incorporated into the purple yam puree. This should take about 2 to 3 minutes. Do the the same for sweet potatoes but use only 2 tablespoons vegetable oil and 2 tablespoons granulated sugar. Toast kuachi (melon seeds) over medium heat for about 2 to 3 minutes. Remove and allow it to cool. Mix into purple yam paste. Divide and form sweet potato paste into 6 balls of 1¼ oz (35g) each. Divide and form purple yam paste into 6 balls measuring approximately 3 oz (85g) each. Wrap each portion of purple yam paste over each portion of sweet potato paste to form 6 balls of filling weighing (4¼ oz) 120g each. Combine golden syrup, vegetable oil, and alkaline water in a small bowl or measuring cup. Sift cake flour into a large bowl. Make a well in the center. Pour syrup mixture into well and mix with a spatula to form a soft dough. Cover with shrink wrap and let dough rest for 30 minutes. Lightly dust work surface with cake flour. Knead dough until smooth adding a little flour if necessary. Divide into 6 portions of 50g each. You will have roughly 100g excess dough. Take a portion of the dough and spread it into a circle of about 4 inches (10cm) with your fingers. Alternatively, you can roll it out with a small rolling pin. Wrap a ball of filling with the dough. Roll the ball of dough and filling between your palms to smoothen. Place into flour dusted mooncake mold. Press to conform to the shape of the mold. Place on work surface and carefully press spring stamp down to get a nice pattern on the top. Lift mold and gently release mooncake onto your palm. Bake in a preheated 375°F (190°C) oven for 10 minutes. Remove from oven and allow mooncakes to cool for 5 minutes. Brush on egg wash and return to oven for another 10 minutes. Remove from oven and brush the tops only with mooncake glaze. 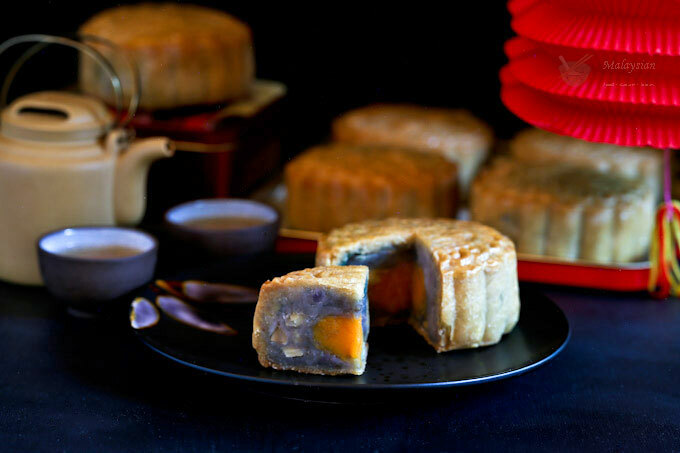 Allow mooncakes to cool completely. Store in an airtight container for one day before serving. Best consumed within 3 days.